Congratulating the Wolves on winning the cup? We are your MAN. On Sunday, 31 May, the freshly-qualified cup winner VfL Wolfsburg crowned its championship triumph with a victory parade through the center Wolfsburg. 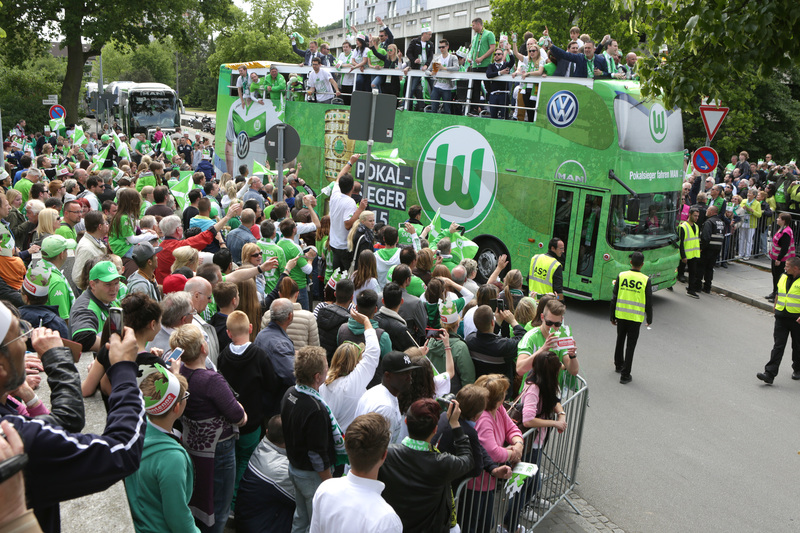 As an official partner of VfL Wolfsburg, MAN contributed a fitting vehicle for the triumphal procession. An MAN double-decker bus normally used for scheduled services had been specially converted for the occasion. On Sunday, it served as a VIP shuttle, lining up in the celebration parade as a real "eye-catcher". Apart from being covered with stickers, the upper-deck windows and seats had been removed. A made-to-measure stage was integrated into the front section of the upper deck as a platform for the reveling passengers. After the victory over Borussia Dortmund in the Cup Final and a long night in Berlin, Vfl´s cup-winner´s parade began at 13.00 h today at Wolfsburg main station. Thousands of Wolves fans lined the route to cheer their heroes. VfL Wolfsburg has been traveling in MAN team buses for many years. Since 2010, MAN has supplied the club´s buses as its official partner. Vfl´s successful women´s and junior teams also tour with vehicles produced by the traditional Munich company.